Please call to schedule an appointment or for directions. 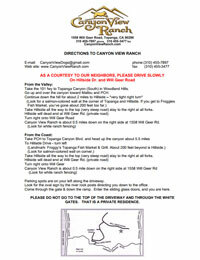 At Canyon View Ranch there are no other extra costs and EVERYTHING is included for one price (except grooming and transportation). Discounts are also available for multiple dogs in the same family. We prefer to keep dogs on their own diet, so please bring their food when checking in. House kibble may be purchased for $2 per day. You can opt to board your dog for training at the ranch on a per-night basis, or select from our comprehensive training packages where your dog stays with us for longer periods of time. (including private lessons with you)$3,000. (including private lessons with you ) $3,000. (including private lessons with you) $5,700. 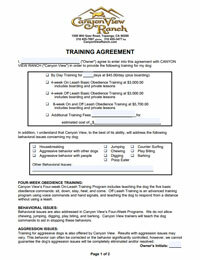 We also offer other programs where you and your dog come to the Ranch for lessons. Not sure which training program is right for your dog? We offer a free evaluation. Call us to make an appointment. Your dog must be wearing a flat nylon collar with a quick release buckle and nametag. No leather collars with belt type buckle or choke chains are allowed on dogs while boarding. If you do not have a nylon collar with quick release buckle, we have them available for purchase at $4.99 each. We are not responsible for personal items lost or drooled on. Your dog's food, medications or supplements, vaccination records, filled-out paperwork (unless you've already provided it to us), a nylon or leather quick release collar with name tags. And, oh . . . don't forget your dog. What shouldn't I bring for my dog? No bedding, pig hooves, food dishes or toys. My dog is on medications. Will you make sure he receives them everyday? Absolutely. 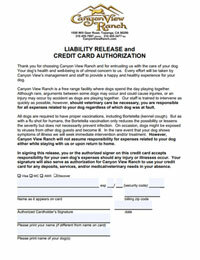 If your dog is currently taking any medications or supplements, we are happy to administer them free of charge. Can I visit my dog while he's staying at Canyon View? Of course. Just be sure to call first for an appointment. Can my whole family be a part of the training lessons? Yes, in fact we encourage it. My dog has a very loving personality - will training break his spirit? Absolutely not. 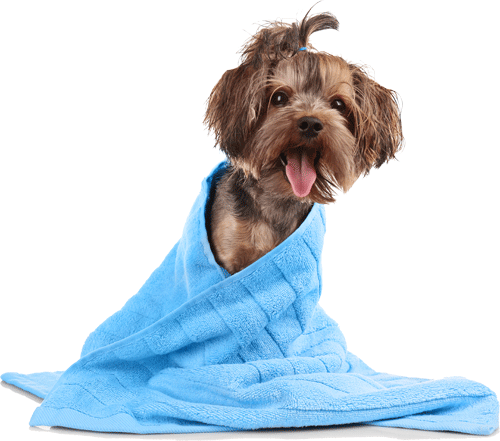 Training simply brings out the best in your dog, and helps correct unwanted behavior. 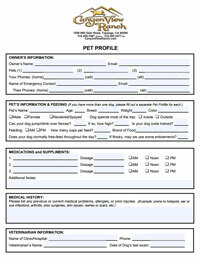 While maintaining all the qualities you loved about your dog in the first place. Yes. It's all about changing old habitsï¿½and creating new ones. In a heartbeat! 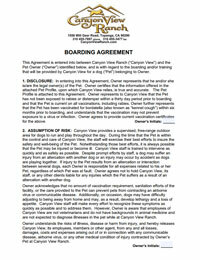 No matter how much fun your dog has at Canyon View, nothing can replace the sight of Mom & Dad.